Well, it is official, I am a candidate for my Masters in Higher Education Administration at Boston University’s School of Education! 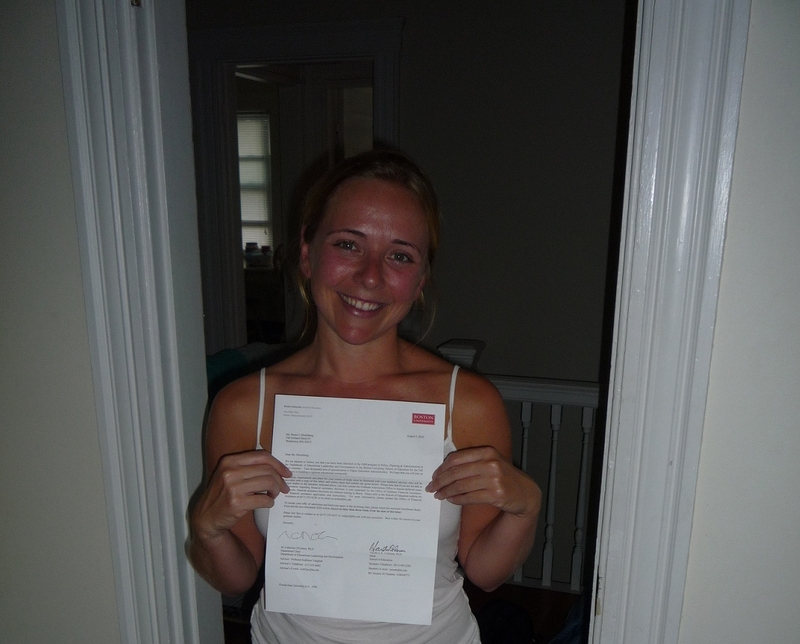 A disheveled me w/ my acceptance letter to the BU SED EdM in Higher Ed Admin program! It has been 11 years since I graduated from Florida State, and I am not going to lie, I was nervous about going back to school. My transcripts from FSU were, at best, appalling, and for a girl who has a Bachelors’ Degree in Creative Writing, I bombed the writing portion of my GRE. BUT, I do write one heck of an essay and I have compiled amazing work experience and references. I was able to bolster my horrible undergraduate academic performance with 2 nice and shiny “A”s. I am fairly certain that if I had not taken those 2 classes, and gotten As, that I would most likely not be writing this blog post right now! So, this is the new chapter in my life. I am excited to be learning again, I am excited to be meeting all kinds of interesting people who are doing wonderful things for higher education, and I am excited to be planning my future career and sorting through all of the possibilities for where it will take me. Maybe it will lead to a PhD program, maybe not. For now I will just enjoy the learning! This entry was posted in Random and tagged boston university, BU SED, first generation student, FSU, graduate school, Higher Education Administration, Masters in Higher Ed, Non-degree seeking, school of education, sed by reneeh. Bookmark the permalink.